Personally, this is something I’ve been waiting for since Canseco’s book came out in 2005. I’ve been sitting back, patiently waiting to see what type of public outcry we’d see when someone from the “Steroid Era” made his way onto the Hall of Fame ballot. As I’d anticipated, it has brought out passionate debate amongst baseball fans young and old. One, I think that no matter what decision is made the most important thing is that Tony Gwynn and Cal Ripken Jr. don’t get lost in the shuffle. These are two players who were heroes to an entire generation of fans and who are immediate first-ballot HOFers. Two, I think it’s about time Bert Blyleven got some Hall of Fame love from the sports writers. Three, I think—based on stats and importance to the game of baseball—McGwire has earned the right to be enshrined in Cooperstown. Of the 21 first basemen currently in the Hall of Fame nine of them would be known by the causal baseball fan. Those nine are Orlando Cepeda, Eddie Murray, Hank Greenberg, Lou Gehrig, Tony Perez, Johnny Mize, Jimmie Foxx, Willie McCovey and Harmon Killebrew. Those numbers hold up pretty well in a head-to-head comparison with Killebrew, but is that enough to get McGwire into the Hall? I think it takes digging a little bit deeper than the stats. Was he the greatest first-baseman of all-time? No, he far from it. Was he a prolific power-hitter and easily one of the most influential players of his generation? Yes and no one can question that. 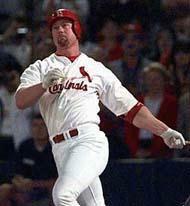 During his playing days as a man McGwire was excellent for the game of baseball. He was the proverbial “All-American Guy.” If he wasn’t out swinging at baseballs he is the type of guy you could have pictured carrying a lunch pail with him on his way to lay concrete. Steroids are the issue here, not statistics. The Hall of Fame is not to be a place where men are elected based on their moral fiber. The Hall of Fame is a place to honor players for the on the field accomplishments. Whether or not McGwire used steroids is for him to know and the rest of the world to wonder. Some people want to say that Jose Canseco’s book is proof enough. Well, I’d beg to differ. Canseco can’t even keep the color of his daughter’s eyes straight in the book. There is no doubt in my mind that Canseco was merely using the book as a way to get himself back into the public light in an attempt to boost his chance at gaining pity votes for a Hall of Fame berth (he is also on the ballot for the first time this year). If you need further proof, that Canseco is the exact-opposite of a reliable news source go out and purchase the Surreal Life on DVD. The other argument against McGwire has been his lack of public appearances since his retirement. Is it so hard to blame a guy for wanting to be retired? 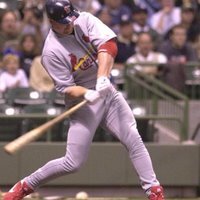 McGwire was on the road for 16 seasons. He is still relatively young (give or take the years playing baseball adds) and wants to enjoy life with his family, tell me what’s wrong with that? Are we going to chastise a player and neglect him entry into baseball immortality because he has stepped away from the game gracefully? 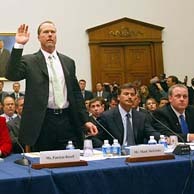 Finally, the argument that comes up most often relates to McGwire’s testimony and/or lack of testimony in March 2005. McGwire didn’t directly answer the question posed to him. Now there are a hundred valid reasons why he wouldn’t answer the question directly. Perhaps he used in high school or college and then stopped. For him to say he never used would be a lie, but if he didn’t use during his career then it didn’t effect him in the pros. It’s as simple as this – you can either hit a baseball or you can’t. I could take all the steroids I want and I’d never jack a homer out of Busch stadium. For those of you who are taking your cuts at McGwire now and those of you who are taking shots at Bonds and others from the “Steroid Era,” remember this these men are professional athletes. They were/are the best of the best at what they do. They got there based on talent and that’s a fact. You can’t fake your way into professional baseball. You can’t fake 583 home runs. You can’t fake 16 seasons of grinding it out on the road, away from your family, just to play a game you love. You can’t fake that. If people want to talk performance enhancers, they have to look at everything. Batting gloves are a performance enhancer. New fielding gloves are a performance enhancer, how many hot line drives would Derek Jeter scoop up using those old leather gloves from the thirties? Video to scout your opponents is a performance enhancer, hell Gatorade is a performance enhancer. Jim Bouton’s “Ball Four” let the whole world know about “greenies” which essentially got players hopped up for games, sounds like a performance enhancer to me. I’m sure it sounded like a performance enhancer to the sluggish outfielders who didn’t have access to them. There is no proof, no matter how far back you go, that all athletes haven’t used some method to get ahead in the game. So rather than chastise one player during an era where supposedly “everyone” was doing it, let’s do what we’re supposed to do as baseball fans and go by the numbers. Let the numbers be judge, jury and executioner for McGwire. This entry was posted in Cheap Seat Chronicles, Hall of Fame, Mark McGwire. Bookmark the permalink.